The program that is heavily subsidized by the public to the tune of $123 million annually is veiled in secrecy. Welfare ranching of public lands, simply put, is the subsidized destruction of our public lands for the benefit of just a few and those few are struggling to maintain anonymity. Livestock grazing is the most destructive and widespread practice on public lands and is responsible for the extinction and imperilment of numerous species across the west. I know right where that is – the Craine Creek watershed in the northern Black Rock Range. The infamous and destructive El Paso Ruby Gas Pipeline would run right through there. You see, there aren’t AN environmental concerns, like highly erodible soils, beat to death lands, uncontrolled cow grazing, etc. 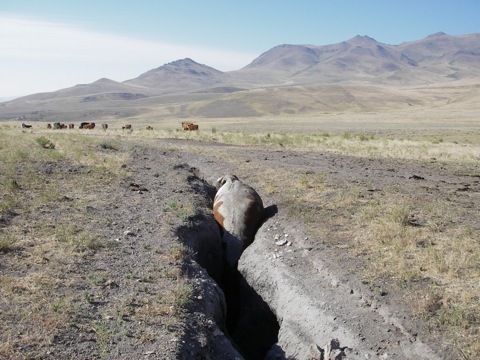 – to contend with in that part of the world … That is an area of a small fire that Winnemucca BLM allowed cows to be turned back out on after minimal rest. That is quite a photo, and tells a story more significant to the West than wolves killing a few adult cows. This is one of the nicer photos of this cow. It’s almost poetic justice. I don’t wish that kind of death on any animal, Ken, not even cows. They are simply the instruments of the groups that are destroying public lands and resources, and getting subsidized to do it. I cannot imagine that eventually the information will be released by court order. I thought Obama issued an Exec Order directing agencies to give greater access under FOIA. Is this case somehow grandfathered under the Bush administration policies of all information is secret. It is amazing that BLM claims privacy concerns for folks who are getting taxpayer money. Perhaps that is another angle to get at the information…federal taxpayer rights to know how their money is being spent. It seems equitable that BLM and FS would be required to release at least the names of businesses or individuals who hold grazing permits. By analogy, the federal government generally has easily accessible databases from which it releases the names of those receiving direct $$$ payments or subsidies under various programs; it has databases from which very detailed information can be obtained regarding federal agency contracts for goods and services with its various contractors – you can even do searches for particular businesses and obtain information regarding totals of contracts given any fiscal year. There seems to be no compelling reason not to release information on who holds permits- as it is in the public interest to do so. The privacy issue is red herring in the 21st Century; no its is even worse it is just a bull….. argument. I hope WildEarthGuardians are successful. Well, you can see why ranchers wouldn’t want the public to have access to who held the permits. Since they are doing this to the land with their herds and abusive grazing practices. Especially places like Nevada where the big allotments these days are mostly mine or water speculators pat Mulroy (Southern Nevada Water Authority, Barrick, Newmont, new Asian owned mines), or hobby ranchers. If some person had a horse or cow die this way, on their own private land….they would likely be charged with cruelty to animals. It shows a classic example of the flagrant disregard for fairness in treatment and legalities when it comes to how average citizens and their rights are handled when compared to public land ranchers. We hear the feds say “no” to publicizing the names of people we are financially supporting. They won’t give names based on concern for privacy. Oh, my darn word! Get real. We tap phones, satellite track children and post signs on the lawns of felons. People have a right to know who is consuming, and abusing, the land to which their citizenship and tax dollars gives ownership. Why is the obsolete rancher allowed to remain anonymous, yet, we can look up people’s identities, taxable incomes, and medical histories on line? If you have a legal contract or financial relationship with the United States, it should be a matter of public record. After all, the public is the sum total of these ‘United’ states. If they(public land grazers) are the good folks they claim to be, what do they have to hide? If I buy a house, you can look it up with an assesors office. If I lease one, you can see it on my credit report. Come on! Sometimes, we use the term “civil liberty” as a manipulative means to justify a selfish end. Looks like a road with a wash out and a dumb cow that fell in a whole. Bit of a stretch for showing poor grazing management. I would fault the road being put in before calling the bad grazing. Of course it is a dumb cow. Are there any intellegent cattle?Ha! They are a dependent domesticated animal. But more over, as an animal that is maintained on public lands, this cow was not actually “managed” at all. The cow, like many, was left to decay and was obviously not monitored or attended to, for quite some time. Yet, the owner was appearantly not concerned enough to check the on the welfare of this cow. But, I entirely agree, the road is signifigant. Is it there for ranch use? Because if it is intended for public use, should the rancher not be accountable for polluting it with his dead and dumb cow? Then again, if ranches were held accountable for his pollution, or damage of public lands….there wouldn’t be public land ranching any more. Public land ranching is a free meal ticket, when you take away the “free” aspect…you lose the passion to continue the ‘tradition’ of ranching. One need only look at the cattle manure and over grazed patches of baren ground to see that there is a problem with the cattle. The dead cow is just a clear and shining example of how unmanaged cattle on public lands really are.